All of our sew-in classes are hands-on. When you bring a machine to class, please make sure that your machine is in good working order, OR you may borrow a machine from us. Please let us know in advance. If you do not see a class or topics you would like us to offer, please contact us at 503-393-0132 and we will try to design a class for you. All classes are held for two hours unless otherwise specified. If you must cancel class, allow at least two weeks notice for full in store credit. 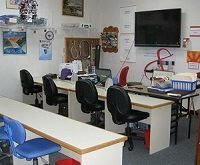 Arrive on time and be ready to learn with materials & supplies prepared for class. Leave your area clean for the next class. Please make sure cell phones are off & put away, as they are a distraction. Children are welcome, but must be considered a cell phone. Please keep extra talking to a minimum while the teacher is talking. Many people are allergic to fragrance- please act accordingly. Thank you for your consideration for others. 1. Your sewing machine in good repair, cleaned and oiled with the foot control and cord. If you need to borrow one of ours, please let us know at least 48 hours in advance. 2. Good scissors--1 pair for cutting fabric and 1 pair for snipping threads. You may also want to bring a pair for paper if it is a pattern class. 11. Additional items that you like to have handy when you sew. Please share your ideas. We're always looking for new tips! Not every class will require all of these items, but if you have your kit assembled, you will have everything you need for class. Please be sure to check the website for instructions on what to do to prepare for your class. Most classes will need you to have your pattern and precut your fabric before your first class. This is a year Long Club that meets once a month or the third Friday or Saturday. Bring your laptop loaded with version 8.1 or Designer 7 and try new techniques. Lots of fun and someone to help you at every turn. Open Sewing all are invited. Bring in your UFO"S (unfinished projects) and your machines and sit in our classroom and get them completed. Have it all wallet has places for everything and easy to make. This handy zip-up Tool Case holds your rotary cutter, scissors, threads,and more in the Vinyl, mesh and quilted pockets, many of which have zippers. Easy, fast and very useful. Using the 2 1/2" strips that Benartex or other fabric lines have created, create you own small rug for your bedroom, bathroom or kitchen. Easy to do, and fun. Oh so colorful, and soft under the feet. Ask Shari Bruno, she has done one for her bathroom. 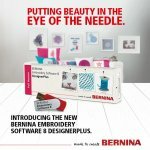 There are so many new features in the embroidery unit of the upgraded 790, or 880 machine. Here is your opportunity to learn first hand what they are and how to use them.